Seven Holy Founders PSR uses the curriculum offered by RCL Benziger "Blest Are We Faith And Word." This parish based curriculum is supported by the Archdiocese of St. Louis and meets the Core Goals established by the office of Religious Education. In order for students to attain their goals, they will require your help and support in studying, reading, outside research, and in practicing prayers. This exciting new Kindergarten program offers Scripture, contemporary stories, activities, prayers, and music designed to sow the seeds of faith. This is a four-session, multi-day format suitable for most Catholic school programs. Stories of God's Love - Kindergarten stands alone or logically follows the two levels of the Stories of God's Love - Preschool program. Blest Are We Faith and Word – Elementary Edition helps students learn, love and live their faith. Engaging Special Features help build Catholic identity. Student books include five units, each with four chapters. Chapters are structured around the four pillars of the Catechism: Catholic faith, worship, life, and prayer. Each begins with a Take-Home page to involve parents in helping their children prepare for the chapter. Lessons follow a three-step learning process inviting the children to Share, to Hear and Believe, and to Respond. Each chapter includes Scripture and church teaching including statements of faith and Faith Words. Children respond through written work, activities and prayer. Chapters conclude with review exercises. Faith in Action pages highlight parish ministries and vocations. A write-in glossary and a mini-catechism are included at the back of each book. Two engaging core texts for grades 7 and 8 - The Story of Jesus and The Story of the Church - help young people deepen and extend their knowledge of Jesus, his life and his teachings, and explore the Church’s history, moral teaching, and the development of its liturgy and sacraments. Each lesson includes Scripture, Liturgy, Multiple Intelligence Activities, Special Needs Activities and more to help young people deepen and extend their knowledge of Jesus, his life and his teachings. Candidates for Confirmation (8th grade) will also receive in the Spring Semester the book "Confirmation: Filled with the Holy Spirit, They Proclaimed the Lord Jesus." This book is an extensive and comprehensive Confirmation program designed to help guide our Candidates as they continue their journey of Christian Initiation into the Church. This preparation is rooted in solid sacramental theology; includes the elements of ritual, prayer, Scripture, doctrine, and reflection; and is centered in "the community, which loves, celebrates and bears witness to the faith. (GDC 68). Information on this page regarding our PSR curriculum texts was taken from the RCL Benziger website. 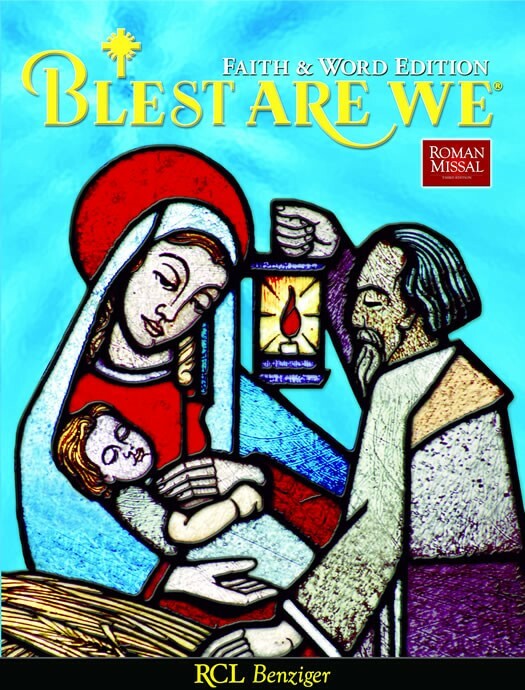 Click here for more information on the Blest Are We - Faith and Word materials.